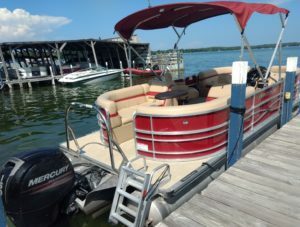 Tri-Toon Details – This boat for rent or for sale! This is a 2017 Berkshire, 22” Berkshire Tri-Toon with Mercury 150HP Four Stroke Motor. This Tri-Toon has Maroon exterior, 25″ Tubes, Tow Bar and More! Upgrades include 3.0 Performance Package and woven vinyl floor!